Over at House Of Rave it’s been busy because of the Christmas holiday shopping season. Owning a store that sells light-up and relatively unique items, I’m always tickled by the surprise hit products that seem to sell like crazy during the holidays. Every year I see odd products that previously didn’t really sell, then all of a sudden see huge spikes in demand. Often it’s products that are unexpected hits, the manufacturer runs out of stock, so it goes out of stock at most stores, so people flock to whatever store they can get it at. It’s basically a Lava Lamp that has one of those electricity-looking plasma balls inside. It’s a new product and actually looks like a slick little room decoration…which makes it prime gift-giving material. Unfortunately the Lava company didn’t anticipate such a high demand for it (likely because this tight economy doesn’t permit companies to easily extend huge lines of credit for large manufacturing runs). Or maybe there was a fire at the warehouse and they all got burned up. Who the hell knows. The end result was EVERY store was sold out. I opened my orders one day and found 20+ orders for JUST this item, all from new customers…it was a little odd. For a while I could send them out, but of course my supply dried up also. I of course immediately cancelled and refunded all the orders since I couldn’t fulfill them….but kept the item up for a while in order to grab new customer info (so I can send them my email newsletter later). Kind of sneaky actually…. I eventually put the “out of stock” status on the item because so many people kept ordering it and the customer service required for canceling and refunding got a little tedious….plus it pisses people off when they order something so close to Christmas then get an email their order has been cancelled. 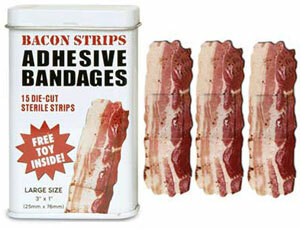 There’s a whole lineup of these novelty bandages, and by far the bacon strips sell the best. 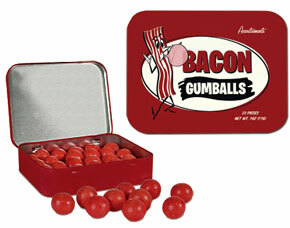 Why bacon flavored gumballs sell so well is beyond my understanding. 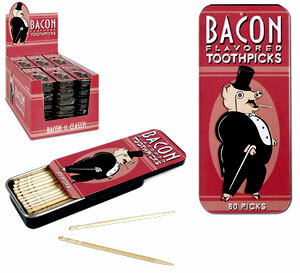 Who would’ve thought the American public has such a fascination with BACON products?? Like the popular Lava Plasma Lamp a lot of these bacon-related products sold out quickly too. It’s a fake gift box you put a real gift inside to fool your unsuspecting subject. I presume this gag box is great for White Elephant gift exchanges, hence the popularity. 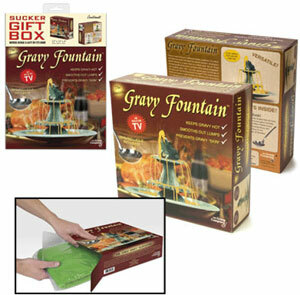 What’s weird is there are other gift boxes like this, but by an exceedingly large margin the gravy fountain box was the most popular. Baffling and kind of hilarious. Most of these small items don’t have a huge margin, so even if you get lots of orders per day for them it’s not a huge amount of profit. However you gain new customers, some of them buy a lot of other stuff, and it’s always fun to see the weird products that hit a nerve with the buying public!